After Hours Delivery: Shipments that require a delivery Monday to Friday before 6am or after 6pm will be subject to a surcharge. Shipments that require a delivery on the weekend or on a US or Canadian holiday will be subject to a surcharge. Application: Rates apply only to the account named on the rate quotation. Appointment Deliveries: There will be a $75 surcharge for appointment deliveries. In the event of a missed appointment, it is the responsibility of the carrier. Maximum liability will be the waiver of this surcharge. C.O.D. Fee: The surcharge for a C.O.D. shipment is $50.00. In the event of a missed C.O.D., it is the responsibility of the carrier. Maximum liability will be the waiver of this surcharge. Cargo Claims/Valuation: Maximum liability is $2.00 per pound. There is no liability for claims under $50.00. If additional insurance is required the customer must make additional arrangements. Change of Terms – Bill of Lading: Must be authorized by consignor in writing. Exceptions: Refer to quotation for exceptions and/or additional conditions. Fuel Surcharge: All shipments will be subject to fuel surcharge in effect at the time of shipping. Handling and Sorting at Maple Gate Facility: $3.00 per piece. $7.50 minimum charge. Heated and Dangerous Goods Service: 25% surcharge on freight charges. $50.00 minimum. Heat Protection: Avoids freezing only, temperature control not provided. Products liable to separate or congeal at temperatures 32 ° F (0 ° C) or above subject to owners risk. Liability: Carrier will not undertake liability for any costs or penalties arising from late deliveries, early deliveries or missed appointments. Loading, Unloading and Special Delivery: Consignor or consignee is responsible for loading or unloading freight. Driver load or unload will be subject to a surcharge of $50.00 per hour minimum $50.00. Owners Risk of Damage: Applies to inadequately packaged goods, used goods or articles, uncrated machinery or goods and personal effects. Pallets Exchange: Maple Gate is not responsible for pallet exchange (4 ways, CPCs or CHEPS). Re-Delivery/Attempted Delivery: Minimum surcharge of $50 will apply. Residential Pickups and Deliveries: A surcharge of $100 will apply to all residential pickups and deliveries. This surcharge does not include a tailgate. Storage: $2.00 per pallet per day, minimum total charge $25.00. Storage surcharge into effect after 24 hours. Tailgate Charge: For Canadian pickups and deliveries $10.00 per pallet minimum charge $50.00. For US pickups and deliveries $10.00 per pallet minumum charge $100.00. Terms: Net 30 days from invoice. Accounts subject to 2% interest charge per month on overdue accounts. Trailer Detention: $100.00 per day. Detentions surcharge goes into effect after 24 hours. 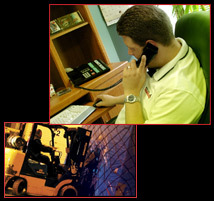 Waiting Time: LTL shipments (18 skids or less) first 1/2 hour free, $50.00 per hour thereafter. FTL shipments (19 skids or more) first hour free, $50.00 per hour thereafter. Weight: Maximum shipping weight per pallet is 1800 lbs, pallets over 1800 lbs will be rated to the skid rate according the the allowable weight per pallet position. The carrier reserves the right to re-scale shipments and bill according to the scaled weight. Terms and Conditions | Maple Gate Freight Systems Inc.